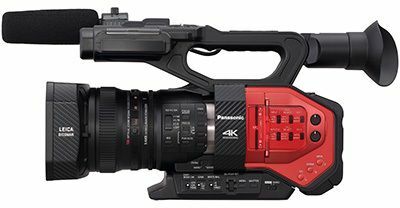 The Panasonic AG-DVX200 4K camcorder has been carefully created to follow in the footsteps of its breakthrough predecessor, the AG-DVX100. This innovation in 4K camera technology boasts itself as the world's first*1 4/3-type large format, 4K/60p*2 camcorder to feature an integrated zoom lens. This sophisticated cinematography camcorder has been thoughtfully designed by us to flourish in a broadcast environment. The AG-DVX200 4K camcorder is an essential camcorder for any professional broadcast applications. – Newly developed F2.8 LEICA DICOMAR 4K lens. – FHD: 28mm - 365.3 mm(35 mm film equivalent). – Beautiful Bokeh effects from a 4/3-type, large-format sensor. – 12 stops of imager latitude faithfully recorded by new V-Log L gamma curve. – Variable Frame Rate with a maximum of 120 fps (in FHD resolution). – 5 axis Hybrid Image Stabilizer. – Intelligent Auto Focus, Custom Auto Focus. – Variety of Manual Focus Assist function. – ND filters (1/4, 1/16, 1/64). – 4.3 inch touch screen type LCD (Approx. 2.76 Mil dots). – 0.39 inch high quality OLED viewfinder (Approx. 1.77 Mil dots). – Battery cover for great handheld shooting experience. – Simultaneous, backup, relay or dual codec recording function using two card slots. *5: Use SDXC/SDHC Memory Card compatible with UHS Speed Class 3 (U3) when using high bitrate video recording mode of 100 Mbps or greater. The use of DCF Technologies is under license from Multi-Format, Inc. The technical data are provided in the download area.